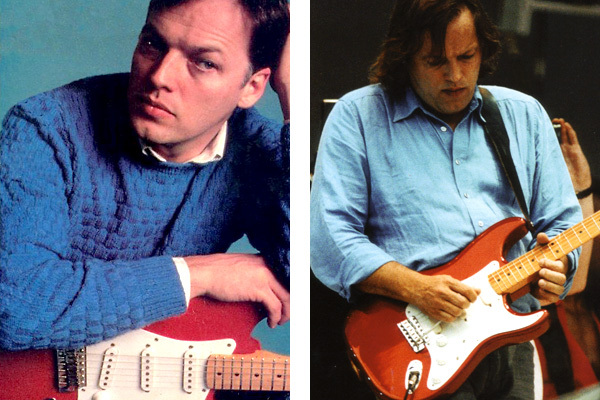 David has always been associated with the Stratocaster and there’s always been two – the black and the red. His main guitar for over two decades the red defined the post-Waters era and holds a special place in many fans’ hearts. It’s also an interesting guitar in terms of Fender’s history. Just prior to David’s upcoming 1984 About Face tour, he and Phil Taylor went to Fender’s London Warehouse and bough a bunch of new Strats because David didn’t want to travel with his old instruments that were beginning to rise in value (International Musician August 1984). Different sources says different numbers but it seems that they bought about six guitars. These included one fiesta red 1983 ’62 reissue with white pickguard and a rosewood neck, two cream colored 1983 ’57 reissues with maple neck and white pickguard (listed as Vintage White in the catalogue) and a couple of candy apple red 1983 ’57 reissues with white pickguard and maple necks. They also managed to get their hands on an additional candy apple red in a secondhand store in Chandlers, UK. The guitar had once belonged to Mick Ralphs, which played rhythm guitar on David’s 1984 About Face tour (Guitarist 1995). It’s interesting to note though, that the red ’57s was never used on the About Face tour, just the ’62 and cream ’57. – (left) David pictured at Royal Albert Hall 2006 with the red Strat featuring the EMG SA pickups. (right) David pictured in his home studio in 2006 with appears to be one of the original red Strats with the original stock pickups. Fender were beginning to realize that the 70’s had been a disastrous decade for the company. CBS had made them cut corners and costs and as a result, players started using copies from the growing number of new companies, rather than an original Fender. In 1982 Fender had sorted out their business and reissued two Strat models – the 1957 and 1962 made at the Fullerton plant in California (Fender and CBS parted in 1985). This was the forerunner to the Custom Shop series but although a major step in the right direction neither of the guitars were true replicas of the originals. They were more hybrids based on the most popular features from each decade and some additional upgrades. According to Fender’s project manager at the time Dan Smith, the reason why they chose the 57 rather than a 54 or 56 was because they though 57 was a cool year all together with all that was happening in music and culture. 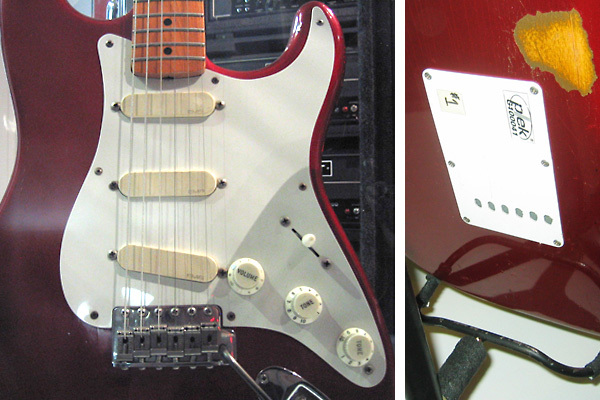 – (left) An early shot of the red Strat (left) with stock Fender pickups from one of the About Face promo pictures. The pickups were first seen at the Live Aid show in July 1985 (right). Although the series were released in 1982 Fender only offered a sunburst finish and David’s red and cream colored ’57 are 1983 models. The red body is alder, while the cream or blonde is ash – both with nitrocellulose finish. The guitar feature a 1-ply eight hole white pickguard, a 3-way pickup selector (it’s not known whether David has replaced his with a 5-way) and a vintage style synchronized tremolo bridge (with David’s custom 4.25″ tremolo arm). Unlike the original 57, these reissues has a C-shaped maple neck. The reason for this was that Fender didn’t have a Standard Series at the time and wanted a reissue that was comfortable to play even for the new generation of 1980s shredders. All guitars has a V infront of the serial number indicating “vintage reissue” – note that Phil Taylor is referring to David’s ’57 reissue necks as V57 and not the C-shape they actually have. The ’57 vintage reissue featured vintage style staggered single coil pickups loosely based on the 1954-57 tone. David is seen with the red Strat and it’s original pickups on some About Face photo-shoots but it seems that he never used the guitar on stage until his guest performance with Bryan Ferry’s band at Live Aid in July 1985. By now, he’d fitted the guitar with active EMG pickups. The EMG pickups and tone controls are now branded as DG20 but they’re actually one of the first single coils EMG released in 1979. The tone controls feature an EXP boosting treble and bass and a SPC boosting the midrange for a humbuckerish tone. Both controls replace both stock tone controls. The pickups are still in David’s red and cream 1983 ’57 reissue Strats. David is also seen playing a red Strat with it’s original pickups during the Barn Jams recorded in early 2007 (studio mixing room footage). It’s not known whether this is one of the original 1983 guitar now refitted with original pickups. 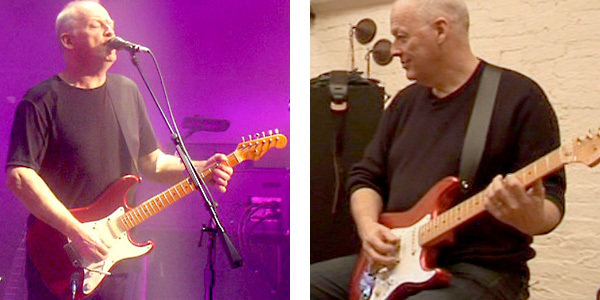 Although David preferred the cream ’57 reissue at first, the candy apple red soon became his main Strat during the early leg of the Momentary Lapse of Reason tour in 1987. It was used for the rest of the tour that ended in 1990 and was again used in Division Bell (album and tour) in 1994. During the latter part of 1980s and throughout the 90’s David did a lot of guest appearances with other artists and bands both on stage and albums and the red Strat always accompanied him being an extremely versatile guitar with the EMG pickups. The guitar was also featured on David’s 2006 solo album (On An Island) and tour although by now the old Black Strat had made it’s return and reclaimed the position as David’s favorite axe. At the end of the tour the red was only used for Shine On You Crazy Diamond. Fender history info gathered from “The Strat Chronicles” by Tom Wheeler and www.fenderreissue.com. Do we know the fretboard radius? I have an MIJ Strat from the mid-80s that’s a 50s reissue but has a 12″ fretboard radius. Just curious if the C-shaped neck came with a flatter fretboard. Do you know how David toggled the 5-way/7-way pickup configuration on the EMG-SA equipped guitars, and what sort of switch/button/toggle he used? I notice that particularly during the pulse tour/album, he uses bridge only, bridge & neck, and all three pickups together at various points, but I can’t seem to find any evidence of a switch or control on the guitar to flip between 5-way and 7-way pickup configurations. Apparantly these 83 reissues came with 3-way switcher. I haven’t seen anything on David replcing that with a 5 way but he might have. What people used to do back in the days was that they found a sweetspot between each position which actually combined the pickups as a 5 way but I have no idea if David replaced it or how he did it. If you listen to Division Bell it sounds like he’s using a neck/middle combo on stuff like Coming Back to Life which might indicate that he replaced the stock 3 way with a 5 way. As far as I know he used the red on that track. How many springs does he use ? In which configuration? He’s using 3 placed in the outer and middle slots/claws.